Carefully choose your flooring. Elect for materials such as laminate or tile which are more resistant to scratching. Hardwood floors are another great option. However, it’s important to note that hardwood floors are not impervious to scratches. If you have a pup that likes to do zoomies in the house, you may want to go for carpet. Wall-to-wall carpet offers a non-slip surface, dampens sound and is scratch-resistant. Choose a low-pile carpet that is stain-resistant and avoid continuous loop designs that can get caught by your pet’s claws. Add area rugs. Area rugs add a finished look to any room. 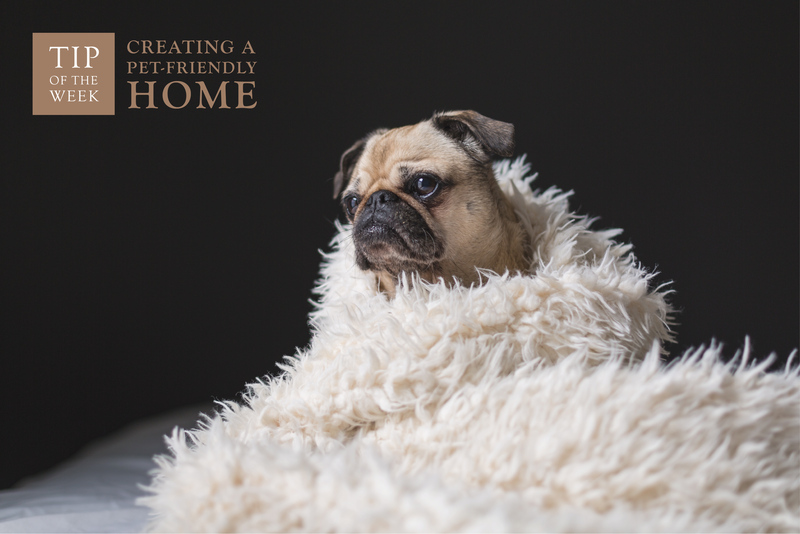 They also protect floors from scratches and stains, provide a comfy place for pets to snooze, and keep your pet from slipping on floors. Elect for a rug with a heavy design and a multitude of colors to draw your eyes away from dirt and pet hair. While some pet-owners opt for synthetic rugs, wool is actually the best option. Wool rugs are stain-resistant and tend to outlive their competitors. Can’t afford wool rugs? Indoor-outdoor rugs are incredibly durable and offer a wonderful cost-effective alternative. Think carefully before purchasing furniture. Velvet and suede are beautiful but you may find they don’t stand a chance against your furry friend. When ordering furniture, bring home several fabric samples and use them to “pet” the dog or cat. You may want to choose the sample that does the best job disguising your pet’s hair. Leather is a another great alternative because it’s durable, easy-to-clean and ages beautifully. If you share your bed with your pet, opt for duvet covers. Duvet covers work better than bedspreads because they can be removed and washed whenever needed. Choose sheets with a colorful pattern that can hide a little pet hair between washings and be sure to protect your mattress with a moisture-resistant mattress pad. Designate a place to store all your pet’s accessories. A stylish basket can be the perfect catch-all for tennis balls and stuffed mice. Select an option low enough for your pet to reach into themselves and make it a nightly habit to place all the toys back in the basket before bed.